This is a great looking terrain mat that is super versatile and can be used for just about any period. We recommend 20-25-28mm scale with this mat. The roads are approximately 7-8 inches wide. 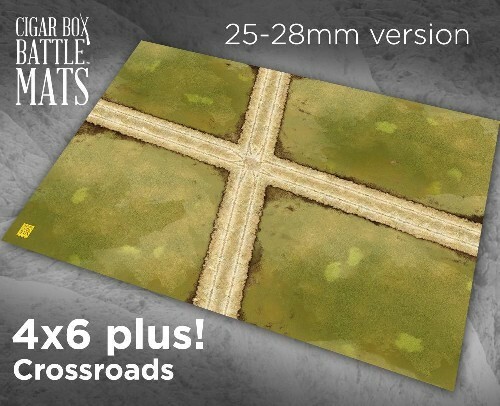 We use this mat for 28mm Bolt Action, 28mm Kings of War, 28mm American Civil War, 28mm Napoleonic Black Powder and 54mm French and Indian War skirmish (the roads become trails). What will you use it for? Just add your own hills, buildings, fences, woods, etc and fight your battle! • 20mm and 28mm tabletop miniature wargaming!